A backyard deck is a perfect space to relax or entertain. With our expertise and quality materials, we can make it a sight to behold. One of the best ways to make your backyard a place to relax is to build a deck and there is no better company to trust with building your deck than Double R A Construction Corp. We can install a wide variety of decks including ground-level, raised, or multi-level decks made from a wide range of high-quality materials including wood and low-maintenance composite decking. No matter what your vision for your new deck is, you can count on us to work closely with you to design and build a deck to not just match your home but also improve it. Give us a call at 1-844-385-9654 or follow the link below to request your design consultation and get a free quote for deck installation in Yonkers, Stamford, New Rochelle, Fairfield, Greenwich, Norwalk, and surrounding New York and Connecticut areas. There are many forms of Vinyl decking product available ranging from hollow extrusions to cellular (solid) products. Hollow extrusions are very common for both decking and railings and cellular products are designed to provide a more wood-like appearance for those aiming to give their deck a natural look. Why Choose Vinyl: Vinyl decking products can be styled to look like wood but without the risk of warping, splintering, rotting, splitting or simply blistering. Dirt can also be easily washed off either by a sponge and hose or a pressure washer. 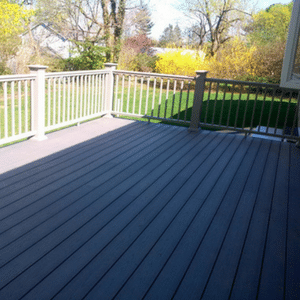 Vinyl decking requires little maintenance while still providing long-lasting quality. 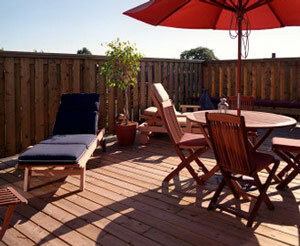 Composite decking mimics the appearance of natural wood. 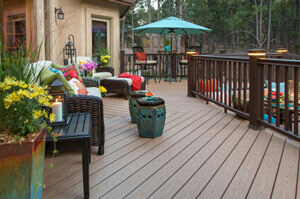 An astounding variety of composite decking, aka engineered wood products, are available. Some offer solid boards while others are hollow. Some are "capped" or "co-extruded" with a layer of PVC while others are not. Others might require other components to assemble while others are built more like wood. Regardless of these differences, there is one key similarity- all are made with recycled fibers, plastics, and binding agents. A major advantage is that, like vinyl decking, composite decking is pre-finished and mimics the look of authentic wood but is far easier to manage. Unlike real wood, composite doesn't require staining or painting and needs little maintenance. Removing dirt is easy with simply a mild detergent and a hose and up to 95 percent of materials used in manufacture are from recycled sources, making Composite awfully environmentally friendly. Wood's natural appearance, versatility, and cost make it the most common choice even today. Wood is a traditional and popular deck material and pressure-treated Southern Yellow Pine tends to be the most popular but a fair few use pressure-treated wood instead thanks to its affordability and longevity. If you want a truly natural look though then cedar may be your best option since it doesn't absorb water, twist or split making it easier to manage while still being natural. Why Choose Wood: Wood's versatility makes it an appealing option as it can be crafted in a wide variety of styles and painted or stained many different colors. Wood decks are also significantly cheaper to install than vinyl or composite decks, although the latter is easier to maintain. Properly constructed and maintained, a wood deck will be quite durable and will last for decades. Wood is also better able to withstand high winds than other materials. One nice upside of wood for those environmentally conscious is that it is renewable, provided it is sustainably harvested, in contrast to many petrol-based materials. Siting: We'll take your home's floor plan, orientation to the sun and prevailing wind, landscaping, and utility locations into consideration as we plan sitting arrangements. 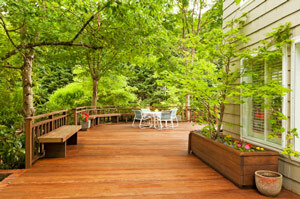 Size and shape: A good way to look at your deck is as a distinct outdoor "room." While there aren't any walls, besides the side of the house, your deck still might need to be built in such a way as to accommodate a cooking area, a dining area, a spa area, and a lounging area. Traffic flow: Since your deck will also be an appealing location to host guests it's important to plan for traffic flow when designing. Railing styles: Since railings are such a noticeable part of any deck we make sure to work with you to chose a type that suits your home and landscape while still providing your family and friends safety. Privacy: If you have close-by neighbors or other privacy concerns we can include trellises and pergolas to truly make your deck a private paradise for just you, your family, and friends. Comfort: The one downside of many decks is that they are not ideal for steamy weather, rain, or other forms of precipitation. However, a roomy retractable awning might be just what you need to protect your deck from the elements without cluttering it. If you can dream it we'll build it! Considering adding a deck to your home? Give us a call or fill out our contact form to get started with your free estimate. When it comes to decks you can't go wrong with Double R A Construction Corp. We are Westchester & Fairfield Counties's experts, serving Norwalk, Mount Vernon, Greenwich, Scarsdale, Ossining, Yorktown Heights, White Plains, and surrounding areas.